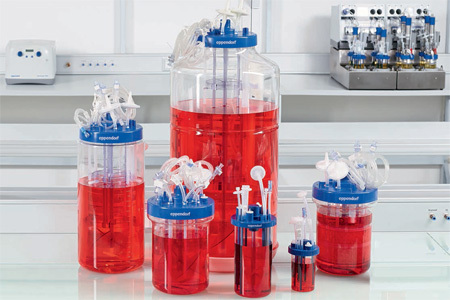 Combine the benefits of single-use bioreactor technology with the reliable performance of conventional glass or stainless steel bioreactors – Discover the Eppendorf BioBLU product line. BioBLU c Single-Use Vessels allow scalable cell culture from research to pilot/production scale. These rigid wall stirred-tank single-use vessels have been specifically designed and optimized for cultivation of mammalian cells, including specialized solutions for stem cells. The BioBLU¨5p vessel is a packed-bed bioreactor perfectly suited for adherent cells and perfusion culture. Pre-loaded with Fibra-Cel® disks, it provides a solid support growth matrix, e.g. for production of secreted proteins. The BioBLU Single-Use Vessels come pre-sterilized and ready-to-use out of the box. Benefit from easy handling, minimized set-up time and the elimination of cleaning and sterilization steps to shorten your development times and reduce costs.